Thanks to one of my long time readers for suggesting this week’s ‘Keep it Simple’ topic – lunch boxes! I’ve been managing school lunches for the past seven years and I don’t love it. Trying to come up with new ideas, dealing with kids who don’t eat sandwiches, and the relentlessness of the task, it just about does my head in! Over the years I’ve tried to find ways to make the task of planning for, organising, and packing lunch boxes as easy as possible. My system is not yet perfect, but here are some simple tips and ideas for taking the stress out of school lunches. Find out what your kids would like in their lunch boxes – no point in spending time and money on food that won’t get eaten. Our school lunches have 3 main elements – fruit and/or veg a snack and lunch. 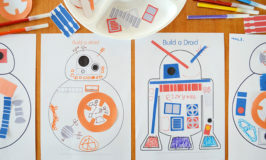 Get the kids to help you come up with a list of ideas and work out a plan. Find some free printable below. Find out how much time kids have to eat their lunches and where they eat – if they are rushing to get outside send food that can be eaten on the go or put in a pocket. Getting the right lunch boxes, containers and equipment will make the process a lot easier. Find out if there are any requirements from your school/preschool (our preschool is rubbish free) and think about the kind of food you need to transport and how your kids will manage them. Reusable pouches, wraps or zip pockets are a good alternative to zip lock bags and plastic wrap and are often easier for small hands, but remind your kids to put them back in their lunch box or in their pockets so they come home. We’ve tried some from 4myearth, My Lil Pouches and Litter Free Living and like them all. An insulated lunch box is great for warmer weather, freeze your child’s water bottle or throw in another frozen item during the summer to keep things extra cold but be aware that condensation from frozen items can make everything else soggy, wrapping a napkin around the frozen thing helps. Prepare as much as you can ahead of time – make it the night before or prepare a week’s worth of snacks on the weekend. Sandwiches keep well in the fridge for a few days so I only need to make them twice a week. Many people swear by freezing a week’s worth of sandwiches but I’ve not tried it. Dinner left overs work great as lunch the next day – pasta or potato salad is a favourite here, or heat up some left over pasta bake and send it in a thermos. Get the kids to pack their own lunch boxes as soon as they are able. All four of my kids pack their own lunch boxes the night before. The older ones do the whole thing, the preschooler does his fruit, snacks and water bottle and I make his sandwich and double check he has everything. Make it easy for the kids to pack their own lunches by having a designated ‘snack’ shelf in the pantry. My kids know they can choose one sweet and one savory snack from the shelf. 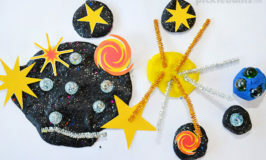 Make lunches a little fun – try putting a funny note in their lunch now and then. You can use our free printable lunch box notes! To make lunch boxes even easier, get the kids to plan out a week’s worth of lunches ahead of time. That way you can make sure you shop for the items you need and the kids know what to pack. 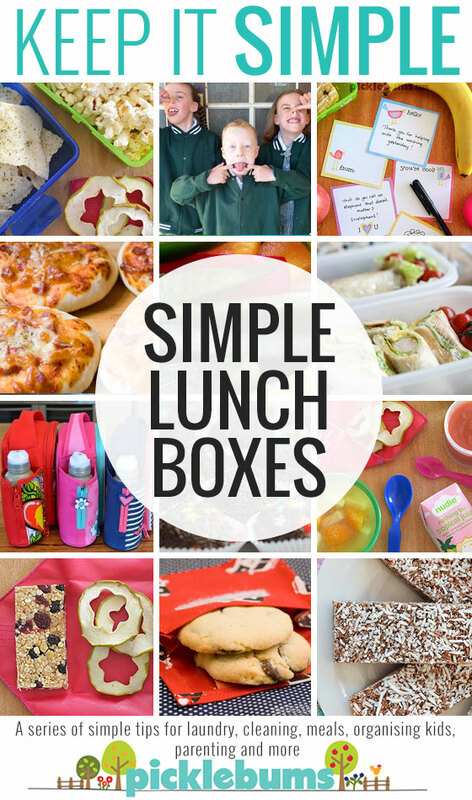 Use our free lunch box printables to help get your organised. You can download the free printable lunch box ideas list here. 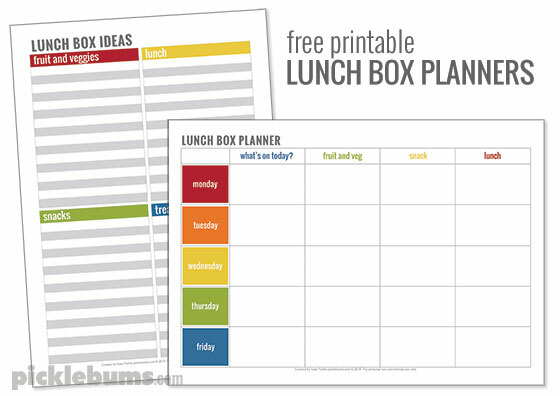 You can download the free printable lunch box planner here. The printables shared in this post are A4 sized pdf files, if you are printing on US ‘letter sized’ paper be sure to select ‘fit’ or ‘shrink to fit’ from your printer options. These free printables are for personal use only, you may not sell, share, or link directly to these files. Looking for some ideas for what to put in the lunch boxes? Try some of these! Quick and Easy Fruit Slice. More freezer friendly lunch box ideas from The Organised Housewife. How do you manage the never ended task of filling lunch boxes? Do you have a tip or trick to recommend? Do you have a great lunch box recipe to share? Leave a comment below with your simple lunch box ideas.